Got braces? 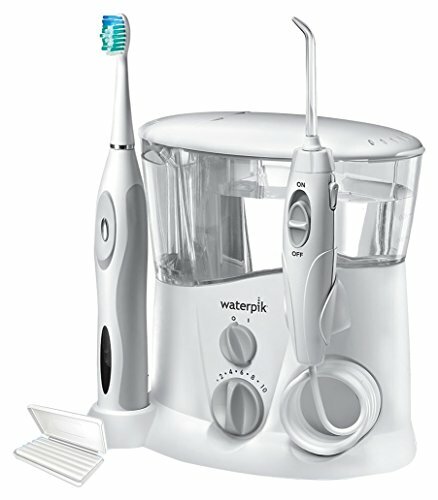 Make taking care of them a breeze with the Waterpik Ortho Care WP-940. It combines Water Flosser and Sonic Electric Toothbrush technologies to create a faster, easier, and more effective daily oral care routine for those with dental braces and orthodontics. Protect your braces investment with superior brushing and flossing in one convenient device that saves counter space and power outlets. It's perfect for all orthodontic phases - braces, retainers, and post-treatment. Complete with 10 pressure settings for low to high power, 2 Orthodontic Tips (OD-100E), 1 Plaque Seeker Tip (PS-100E), 1 Classic Tip (JT-100E), Orthodontic Wax, rechargeable Sonic Electric Toothbrush, premium toothbrush travel case, 2 brush heads (1 Standard SRRB-3W, 1 Compact SRSB-3W), and 2 different brushing speeds.